many of which are permanently on display at Aquaworld. 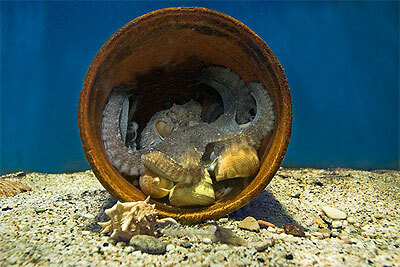 The octopus is said to be one of the most intelligent creatures in the sea after the marine mammals. However that may be, each one certainly seems to have a different personality and all tend to react positively to visitors. With its eight 'legs', blue blood, three hearts and the ability to change colour at the drop of a hat - the common octopus can be seen to be anything but common! Although we haven't tried it out as yet, apparently another octopus could learn how to do the same just by watching her - truly fascinating! 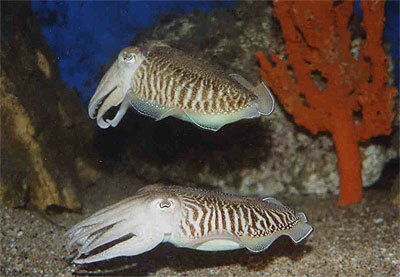 A close relative of the octopus, the cuttlefish is another fascinating member of the cephalopod family. Amazing colour displays are just part of the mystery of this creature which so often ends up on the dinner plate. 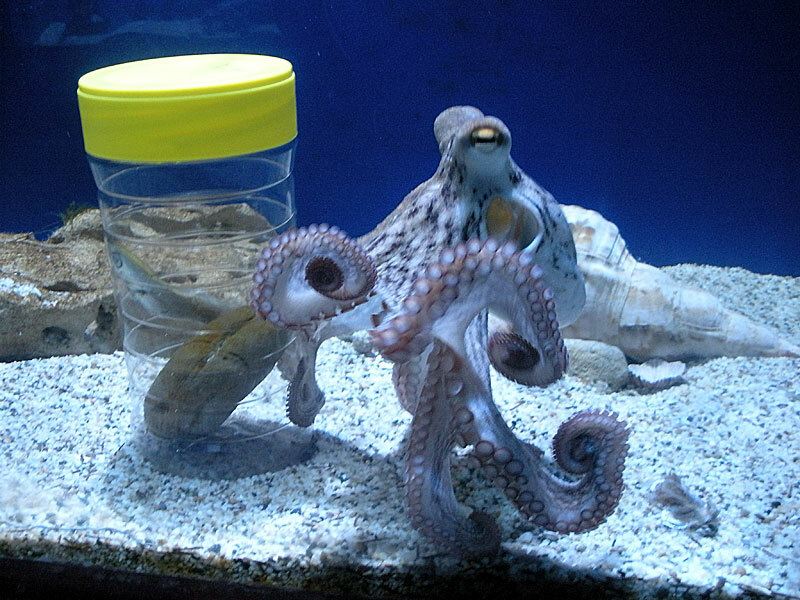 Cuttlefish are particularly sensitive to changes in water quality and can easily be stressed, so they are often released after just one or two days on display at Aquaworld. One of the two lobsters commonly caught by Cretan fishermen, the shovelnose is also known as the Spanish or slipper lobster. As you can see, it has no large claws for offence or defence. 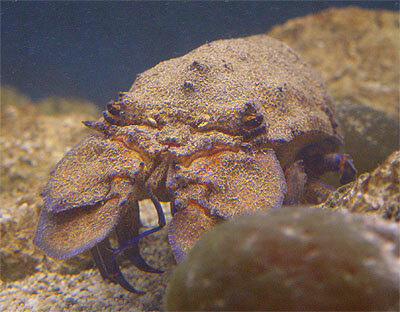 Instead, this lobster relies on camouflaging itself between the rocks during the day, but it can flick its tail open and closed to scoot off backwards when necessary. This lobster is worth so much to the fishermen that one coming in on the nets is greeted with the cry "Viagra! Viagra!" - obviously not one of the more traditional Cretan yells! 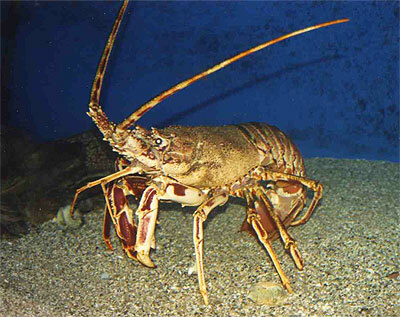 The second of the local lobsters, the spiny lobster one can reach weights of 3kilo or more. Again, much prized and appreciated by locals and visitors alike, it is very valuable to the fishing industry. As such, lobster pots are banned in order to preserve stocks. Unlike the shovelnose, the spiny lobster does have long, sharp claws and is known to ambush prey fish, especially at night when it emerges from the caves and rocky overhangs it uses for shelter during the day. 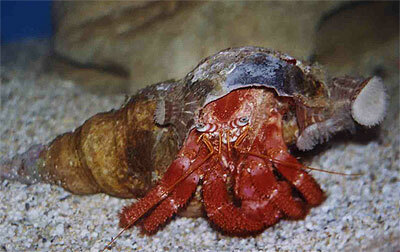 The striated hermit crab is often found in association with this particular species of anemone. In fact, the crab is so keen on having its shell covered with them that it will fight other crabs to try and steal theirs. The stinging tentacles of the anemones protect the crab from predators such as the octopus, so one can understand their passion for them! In return for its help, the anemone gets carried from place to place and presumably gets scraps of food as the crab tears its prey apart. Whoever first named the anemone obviously misunderstood the relationship and called it a parasite, but the partnership is now recognised as a classic example of symbiosis. Although it can reach over 80mm across its carapace, the warty crab commonly found in pools around the Cretan coast is generally a lot smaller than this. An opportunistic feeder, it hides in rocky crevices and often uses anemones for protection and camouflage. Caught out in the open, however, this crab shows no hesitation in preparing to defend itself and is capable of delivering a very painful nip! 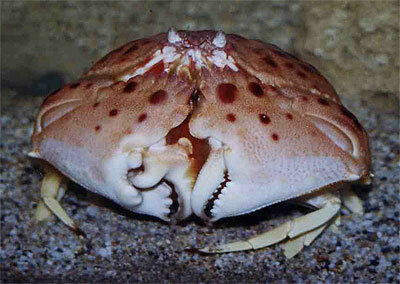 There's no prize for guessing how this crab got its common name! The two long arms fold in half when at rest, but as you can see, this crab also has no qualms about using them for self-defence. 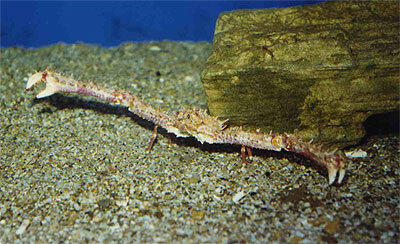 Long-armed crabs are among those unfortunates who are often ignored in fishing nets and left for dead. As in all such cases, we remove them when we find them and try to get them back into the sea if at all possible - with just a few specimens kept at Aquaworld for you to see. The mantis shrimp is another ambush predator. It lives in a burrow from which it can attack rather like a praying mantis by attacking with its fore-arms. The main difference is that this shrimp is much faster! There are several kinds of mantis shrimp - some spear their prey with sharpened appendages, whilst others deliver a knock-out blow with a more blunt style of instrument. The latter can strike as hard as a small-calibre bullet, enough to shatter glass as some aquarists have discovered to their dismay! 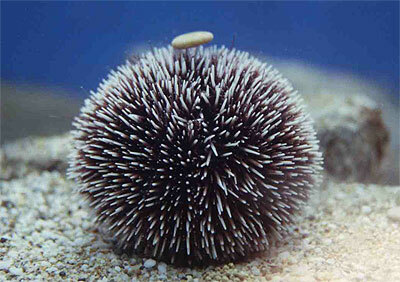 The purple-spined urchin is one of the prettiest found in Cretan waters. Small specimens are rarely seen because they live at greater depths, migrating to shallower areas as they grow. Large individuals can be as much as 10-12cm in diameter. 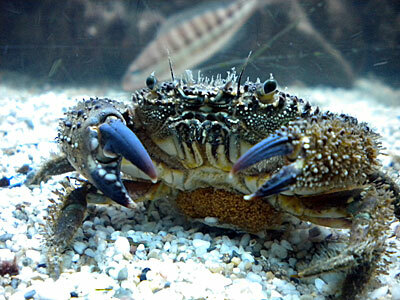 Very useful in Aquaworld's aquariums, the sea urchins graze on algae and help keep the glass clean. 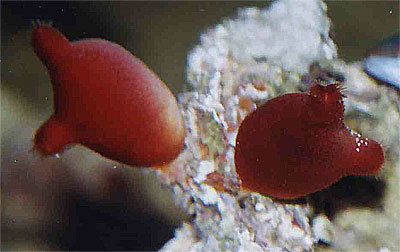 The sea potato is, in fact, a sea squirt. Having spent the early part of its life as part of the great mass of zooplankton and looking rather like a tadpole, the adult settles down onto the sea floor where it collects tiny particles of food by filtering water through its body cavity. The flow of water through the animal is controlled by the two openings - one allowing inflow only and the other outflow. 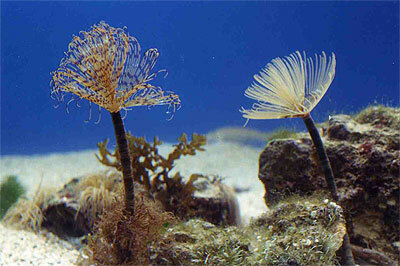 Feather duster worms are found from depths of just 2m to 50m or so. The ones photographed here have constructed soft tubes, but other species build hard, calcerous ones into which they withdraw if disturbed. Often mistaken for plants, coming across a large feather duster worm whilst snorkelling or diving is one of the true delights of a holiday in Crete. One of the most amusing of the local crustacea, the shamefaced crab does indeed seem to be hiding its visage as if guilty of some social gaffe. In fact, those heavy claws which protect the more delicate parts of the crab are specially designed for peeling sea snails apart. Again, occasional specimens are rescued from the nets and either released or brought back to Aquaworld for all to admire for a while. Boats which catch considerable numbers sell them as human food and they are considered a fine accompaniment to a glass of Cretan raki.